The upcoming German election has reached school premises after the 14-year-old daughter of a local rightwing Alternative for Germany (AfD) politician took part in a poetry competition. The girl, who spoke about immigration into Germany, was disqualified by organizers even though she clearly got a big applause from the crowds (see video). 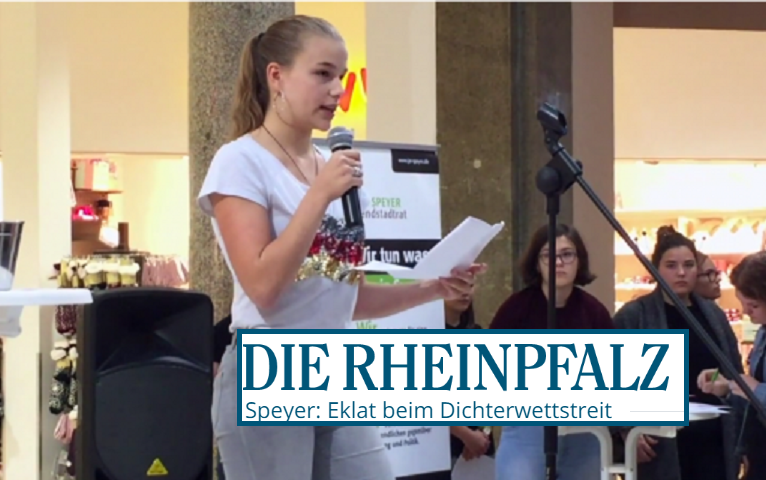 Fourteen-year-old Miss Ida Marie Müller, daughter of politician Ms Nicole Höchst, performed a poem for a school competition in front of an audience of 100 spectators in Speyer, southwestern Germany. The competition, open to all schools, was part of an anti-racism initiative for teenagers and was hosted by the Speyer Youth Council. The town is governed by Ms Angela Merkel’s CDU party. Young Miss Müller decided to speak about the recent wave of stabbings by immigrants and some lines of her poem read: "From far away the man fell into the hands of traffickers, with no passport and a mobile phone. He arrived in our hallowed German land. Because he can't get a lady, he helped himself to one with a knife." Even though organizers admitted that the girl received the loudest applause (as can clearly be noted from the end of the video), organizers still decided to disqualify her. 14-year-old Ms Müller was told afterwards she would not be allowed to attend the award ceremony, and the local Mayor, Ms Monika Kabs of Ms Merkel’s Christian Democrats (CDU) accused the girl of using the Poetry Slam as a platform for the political party, AfD, of which her mother is a member. The young girl received messages of support on social media and shared pictures of the outside of her house, which by now has been sprayed with anti-AfD graffiti. "Modern Nazis smear other people's houses," she wrote. The anti-immigration AfD is currently the second-largest political party in opinion polls, but given it’s rightwing rhetoric (and Germany’s past) it is still very controversial. It entered parliament in Germany for the first time in 2017, winning 12.6% of the vote and more than 90 seats. If current opinion polling is to be believed, it would win 18% of the vote if federal elections were held today. Thats the left for you. Always fight dirty! It’s time for America to venture to Germany and help the Germans that want Germany back from the muslim. her home was likely attacked by Jew-funded, ANTIFA filth. Is this Saudi Arabia, Iran or Venezuela now? Clearly, these people should have their land re-established, and the war machines stopped, so they can move back into their own lands and live among their own culture. These "Global Citizens" presented them with roses, and now they don't know what to do with them. They have nothing in common with "Europe" , or their once held, values. Are they blind, can they not see that "Diversity" is literally killing them? This girl is 14? She doesn’t look like it. What are they putting in Germans’ water these days? She looks like Cenk Uygur's female sidekick, not a 14 year old. I mean, his female sidekick may ACT like she has the maturity level of less than a 14 year old sometimes, but this is too striking a resemblance. Obviously the Time Is Now for Germans, (Europe"s & the World"s hardest working people) to form their own National-Fighting-Militia to control & throw-out filthy Muslims, Merkel and other filthy politicians who undermine these good Germanic people , even getting them attacked & killed …Hundreds of Good Deutsche Frauleins have been killed by these Muslim Pigs…. Ever notice how Hitler ain’t lookin so bad anymore. Except for the Jewish thing.